There are still a few more weeks left to enjoy your summer break, you’ve likely started to see sales for back-to-school items, including supplies, clothes, and backpacks. Healthy snacks should be part of those items. Although you and your kids may celebrate (or groan) the thought of returning to school, there are many ways to get your kids into a healthy routine before that bus comes around the corner. In my opinion, there’s one place where you can alleviate the back-to-school blues and that’s in the kitchen. While your kids may balk at the idea of eating something new or different, getting their input on food choices and allowing them to get their hands a bit messy gives them power over their choices. So, get them involved in the meal planning. 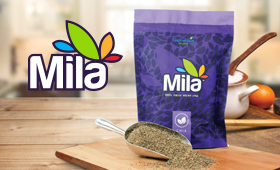 As a prized superfood, Mila® micro-sliced chia seeds can be easily added into some of their favorite foods or recipes. As a staple in the Mayan and Aztec cultures, this gluten-free, trans-fat free, sugar-free, and plant-based source of protein and fiber can be a staple in your kitchen. What could be more fun and kid friendly than chicken strips? Skip the fried chicken and make chicken tenders with a twist. Have your kids mix about a quarter cup of Mila to the breading mixture and you’ll have a crunchy alternative to the popular fried chicken. Add chia seeds to your whole wheat muffin batter for a quick, last minute breakfast or afternoon snack. Using fresh or frozen berries, you can freeze these muffins and then put them into your kid’s lunch bags to thaw. They are a great alternative to a traditional high-fat muffin. Create a more fiber- and protein-rich breakfast by adding a scoop of Mila to homemade granola. Most pre-made granolas are too high in sugar and calories and low in fiber. Create your own with dried fruit, nuts, oats, a dash of sweetener, like honey, and Mila! Spaghetti and meatballs were a weekly staple in my youth. Mila gels and expands when added to liquid, so it’s a great binder in place of eggs in your homemade meatball recipes. Frozen fruit and spinach are great to have on hand for morning smoothies. Combine your favorite fruits, such as strawberries, bananas, and peaches for a taste of summer! Add in a tablespoon of Mila to boost the nutrient content. For dessert, make some healthy ice pops with Mila to beat the summer heat! Your child will never know their healthy! Try using fresh mango, soaked Mila and coconut milk. Let two tablespoons of Mila soak in ¼ cup of water overnight so they are ready to go! The next day, blend the mixture with one can of coconut milk and fresh mango (frozen works fine too). Pour into your ice pop mold or ice cube tray and freeze! Create a healthy, high fiber dessert! Combine five tablespoons of Mila with two cups almond, soy, or other milk, ½ tsp. vanilla extract in a sealed container and let the Mila go to work! Let it sit in the fridge for at least two hours. Once it gels, top with your favorite nuts and fruit! Again, let your kids create their own, healthy masterpiece! You can top just about anything with Mila — yogurt, oatmeal, eggs, salad, pasta ;o)and cereal — the options are endless! Just remember to start your child with a ½ tablespoon. With three grams of protein, five grams of fiber, omega-3 fatty acids, and calcium, Mila is definitely a super food for super kids! ← Ten years and GoYin strong!